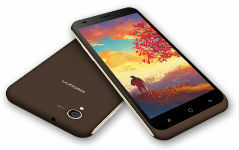 Karbonn on Tuesday has launched Artificial Intelligent (AI) based smartphone Aura Note 2 . Priced at 6,490, Karbonn Aura Note 2 is available in a 2 beautiful color variants Coffee Champagne & Black Champagne. Coming to Specification the smartphone sports a 5.5 inch (720x1280 pixels) HD Display. It is powered by 1.25GHz quad-core coupled with 2GB RAM & 16GB native memory that can be further expandable upto 32GB via microSD card. Under the hood the smartphone offers a 2900mAh battery and it's run on Android 7.0 Nougat Operating System. For Photography, Karbonn Aura Note 2 offer 13 Megapixel Back camera along with 5 Megapixel camera on the front for selfie lovers. Connectivity options includes Wi-Fi, GPS, Bluetooth, USB OTG, and FM radio. This Dual Sim VoLTE Feature enabled smartphone also have accelerometer, ambient light sensor, and proximity sensors and it measures to 115.00 x 78.00 x 8.00mm. Aura Note 2 weigh 164.00 grams. That is all, we know about this mobile till now . We will update you all once this mobile is available for sale online.